Elise’s Soul Line-Dancing class. The sign behind us reads: “I will work hard for what I want. I will never give up. I will make progress not excuses. I will live active.” Great words to live by, if you ask me. Which one’s better? 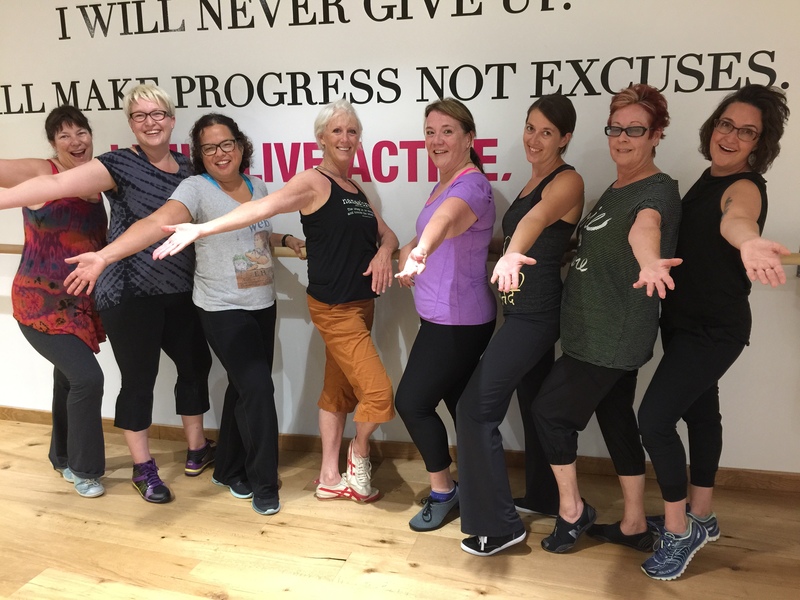 Zumba or Soul Line Dancing? That’s what I set out to find out. All because one of us—I’m not saying who—decided to throw down the gauntlet. And once that happened, all bets were off. It was me versus Elise. Zumba versus Soul Line Dancing. The east side of the freeway versus the ocean side. Fitbit Flex versus some other, fancier model. In other words, it was Hammer Time. She’s brilliant and smart and makes me laugh. (And everyone knows I love to laugh!) She also takes in dogs that need some good old-fashioned TLC, and currently has three living with her. Most recently, she and her family rescued Stevie the Wonder, a blind dog they found roaming the streets, replete with a serious infestation of fleas. Poor Stevie. Yet I’m happy to report, thanks to Elise and company, Stevie is doing great. 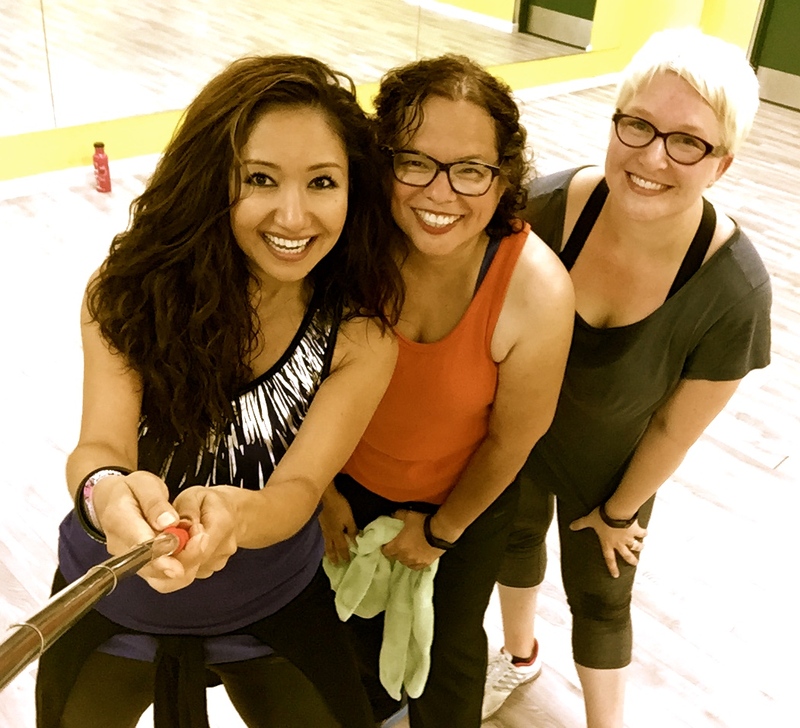 L to R: Zuliya, my wonderful Zumba instructor, me and Elise! Back to the dance-off. Our story starts with the Fitbit we each wear, which motivates us to take gads of steps each day. One day, Elise messaged me and asked why my daily step count is so high. She said I was an inspiration to her, which made me feel pretty cool inside. But I said I can’t take all the credit. It’s Zumba and all the amazing dance moves we make in class. I just love Zumba! Which is when she told me about her soul dancing, which I assumed meant dancing to soul music, but then I wondered what if it was really more like some work out to chicken soup for the soul? So I was curious and maybe she was, too, about Zumba I mean, for the next thing I knew we were making plans to take part in each other’s classes! With some trepidation, I went to Elise’s soul line dance class. After all, I had no idea what to expect and what if I failed at it? Or what if the instructor got mad at me for slowing down the class and kicked me out for being terrible at soul line dancing?? When the day came, I journeyed across the freeway to just a couple of blocks from the ocean and met Elise at her office. OMG, I could’ve spent all day perusing her office! I was like a kid in a toy store made out of candy hearts and chocolate Kisses, and I knew that if left to my own devices, I’d be there all night trying to choose. So I asked Elise what book she was most recently working on and she showed me a book sitting on her desk titled “Land of Love and Drowning” by Tiphanie Yanique. A tale of the Virgin Islands, circa early 1900s, filled with love affairs, curses, magical gifts and at least one shipwreck. Now that’s a book for me! Elise just adores her instructor, Meeshi. Soon we headed to my very first soul-line dance class. What a relief when I discovered chicken soup had nothing to do with this class. It was all about dancing to some nice tuneful soul music. The instructor would break down a dance he choreographed and teach it to us in spurts. Once we learned the steps, he’d move on to the next section of the dance until finally we’d dance the number a few times all the way through. I of course was a natural at it—provided I kept my eye on Elise’s fancy footwork and not trip over my own feet. The class kept a good, comfortable pace. I broke out in a sweat at some point, but I was never panting or out of breath. I enjoyed myself and found the key to succeeding at soul line dancing is concentration and memorization. Two weeks later it was Elise’s turn to come to my class. How would she do? Would she like my Zumba class I take at the Boys & Girls Club which is a frenetic, high-energy class in which you’re constantly moving? You hear that everyone? I’m pretty sure she meant I was AMAZING! So which is better, Zumba or Soul Line-Dancing? I’ll leave that up to you to decide. After all, to each his own. Next up for Elise? She has registered for a Michael Jackson Dance Workshop, which sounds like great fun. Me? I’m ready for a nap. Hope you come back soon, Elise, and show me your new MJ dance moves! I love dancing, and was naturally drawn to some Zumba classes at my gym. Though I do believe I have a lot of soul, this is the first I’m hearing of soul line dancing. Sounds like something I’d enjoy. Doesn’t it all boil down to having fun while you work up a sweat? Deborah, you should definitely look into soul-line dancing. It’s like pretending you’re a member of the Temptations or Four Tops, dancing to soulful tunes. Only you are not expected to sing, too. I had never heard of it either, so maybe it is a new trend. I mean, for all I know, it is only on the west coast now and is gradually making its way to the east. Keep me posted as to whether you find it in your area. You look fabulous and this sounds to be great fun. Me? I would have never made it out of that office, not one foot. Val, the thought occurred to me that I should just stay in the office to peruse all those books. But on the other hand, I was on a mission to find out what this soul line-dancing is all about. So maybe I can finagle a visit to the office another time. Fingers crossed! Well, assuming there’s a video, Elise, I’m afraid, would come out on top. She was a natural at Zumba, where as I kept struggling to keep up with the choreography of soul line dancing. It’s brutal! Well you know what I’d do Monica. First, I would sit in Elise’s office. I wouldn’t budge. Not that I wouldn’t want to soul dance or zumba. I love the idea of both because I like to move. And yet, I go back to the books. Floor to ceiling? wall to wall? I want to be there. I’m adding that title to my lot. If Robert’s invited, I want one too. Now to the moving… I just got home from my run. It is a 2.2 mile trek. Not a lot, just right for twice a week. I have my music and I run keeping pace to the sound. It makes me feel happy. Happy to be out. Happy to feel that rush of adrenaline, happy to be alive. I do yoga too, that keeps me sane 🙂 Some day I’m going to a soul dance class… I love the sound of it. Your post made me smile, as always. Looks like a happy group. After a few minutes I’d need that bar to hold me up. Ha ha, Carl. It’s fun though. Dancing beats just plain exercising any day of the week! This is so great, Monica!!! Loved reading this and will share it. I will definitely come to Zumba again!! Thanks for plugging my book, too. XOXO. Well next time you return, we’ll have to do another coffee run, too. Loved our chat! I haven’t taken a fitness class in several years, Monica, but part of me misses it. I’m self-driven, though, so it’s not exactly necessary for me to have somebody push or prod me to stay active! These days, beside my customary daily walk — rain or shine! — I’m trying to learn Yoga. My doctor told me it’s ideal for strengthening one’s core, as well as for toning up, so there’s that. Frankly, I find the slow pace challenging, as I’m used to much more activity, but maybe that’s a good thing. We will see. Congrats on succeeding at another form of dance, though — sounds like lots of fun! Soul Line Dancing is fun, Debbie, especially when you get the steps right and it looks like everyone’s in sync. But I just love the exhilaration and high on life I feel when I’m in Zumba mode! I am shattered after reading all that. The important thing is of course that you have fun, and from the looks on your faces I think that’s mission accomplished. Personally I would have been happy to have sat and worked my way through the books. Well played, Robert, well played. Getting lost in a good book beats just about anything. Good choice! I’ll see if I can finagle an invite out of Elise for you. Providing she throws in the air fare count me in.